Looking for a balloon maker for hire in Vancouver & Lower Mainland? 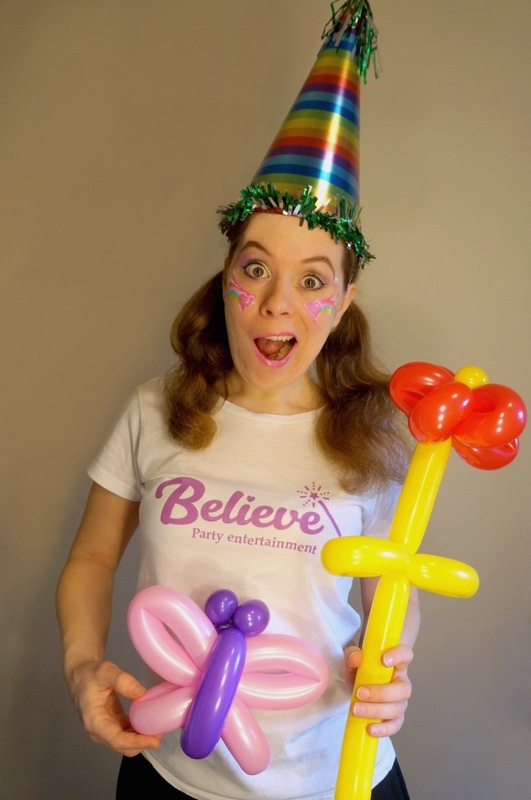 Hire a balloon person for parties from Believe Party Entertainment! Our balloon twisters will make any party or event in Vancouver fun-tastic. Whether you're looking for a balloon maker for your child's birthday party, or a balloon entertainer to hire for your event, we've got you covered! Balloon making is the perfect way to inject some color and fun to your party, and it's guaranteed to make the kids smile. We provide balloon artists for hire for birthday parties, schools, play cafes, play centres, shopping centers, restaurants and more! Our balloon entertainment is available in Vancouver, Richmond, Delta, Burnaby, New Westminster, North Vancouver and West Vancouver. We also travel to Coquitlam, Port Moody and Surrey for a small fee! Our balloon twisting services provide great value, so take a look at our balloon artist rates on this page or explore our combo packages for face painting and balloons for children's parties. Why Choose Us for your Balloon Entertainer? Balloon artist near you in Vancouver & Lower Mainland - Great service & value! Hire a professional balloon maker and you will get reliable, quality service. We use high quality biodegradable 100% latex balloons only, which can last for many days if handled gently! On Sundays and weekdays you can use our Balloon Twisting Rental just for 1 hour or a small kids' birthday party as we don't have a minimum hour/booking requirement except for Saturdays & public holidays. We don't charge any unneccessary admin or set up fees and there are no other additional fees as long as you are located in our service area. We have gone through the necessary police checks for those working with children, so you can have 100% peace of mind. Choosing a ​Balloon Maker hire with appropriate insurance is of paramount importance. Believe Party Entertainment are fully insured. Believe Party Entertainment is a registered and licensed kids entertainment business in BC. Balloon Artist Rates - How Much Does it Cost? No admin or set up fees! We use high-quality, biodegradable 100% latex balloons! Looking for multiple balloon artists for your event? Ask us for custom balloon twisting quotes! *Not available on Saturdays, public holidays falling on a Friday, or Sundays preceding a public holiday. Please book a minimum of 2 hours on such days. You can also choose a combo package with face painting, balloon twisting and/or party entertainment! Travel is included to: Vancouver, Richmond, Burnaby, Delta and New Westminster. A travel fee of $20-$50 applies to North Vancouver, West Vancouver, Coquitlam, Port Moody, White Rock, Surrey and Langley. A rush hour fee may apply on weekdays. Please ask for a quotation to your location. Please note service area and travel fees may differ from what is mentioned here depending on which artist attends your booking. * 1.5 hours not available on Saturdays, public holidays falling on a Friday, or Sundays preceding a public holiday. Please book a minimum of 2 hours on such days. Party entertainment includes party games and dancing, hosted by a kids birthday party entertainer. ​How do our Balloon Twisting Services Work? ​Don't worry, booking a balloon entertainer with us is a breeze! ​Choose your balloon entertainment package. For best value, we recommend our combo packages with face painting and balloons, or our princess party packages with face painting and balloons included! Send a booking request ASAP (preferably at least 4-8 weeks prior to your party or event). ​​We will reply to you with instructions on how to pay the deposit to confirm your booking. ​On the date of your child's birthday party, we will text you when we set off, so you know we're on our way! Sit back and relax, while we keep the kids entertained! Why​ Choose our Balloon Twister for Hire? It's important to choose a ​balloon artist in Vancouver who you can trust. Believe Party Entertainment are a professional children's party entertainers. We are fully committed to providing you with the best possible experience, and we conduct our business in a professional manner. An amazing professional... You've got to love her commitment! An amazing professional and also so patient with the kids and their creative requests. You've got to love her commitment to helping you have a great party for your kid and she stays until the last kid has his balloon animal and face painted. She was able to make every one of the children happy! She was on time and even while setting up was sweet and engaging with the children […] She was able to make every one of the children happy. She has a friendly demeanor and was able to handle and engage with all the children. Availability is Limited, ​Hire a ​Balloon Maker ​Now! To avoid disappointment, it is recommended to book your ​balloon entertainment as soon as possible!